Great gift ideas for Mothers Day, Fathers Day, Birthdays, Graduation, Christmas, or just the right incentive to encourage a new shooter. The Shotgun 101, or Pistol 101, are great place for new shooters to start. You can buy gift certificates in any amount and for any occasion. These are fully registered and never expire. Purchase in any amount you like. You can buy any class, or an hour or two of private training, or any dollar amount to use any way they want. Call us or email your needs and we will email you an invoice that can be paid by credit card, cash or check, and you gift certificate will be in the mail the next day. Or you can buy your Gift Certificate online. Choose the amount you would like to give or enter your own amount, and pay with any major credit cards or with a PayPal account. In the payment comments section, let us know the name of the person that is to receive the certificate. 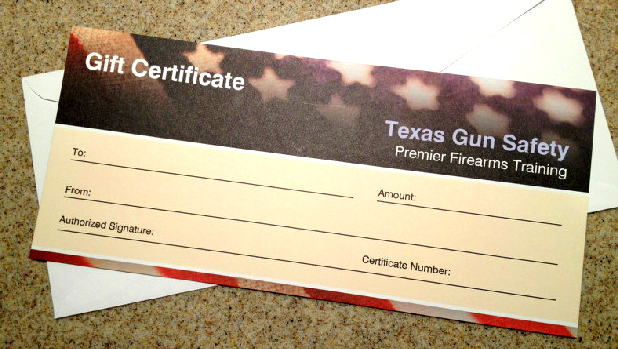 You can click below or call us to order your personal Gift Certificate.